Here is best"AFGHANISTAN VS IRELAND " 3RD ODI match ,Dream11 Predictions for the Fantasy user ,who venue are looking to make a strong team for maximum win. We are providing latest news, match update, information about the match .The team is picked by using various factors on the basis of performance, ground stats and latest form. 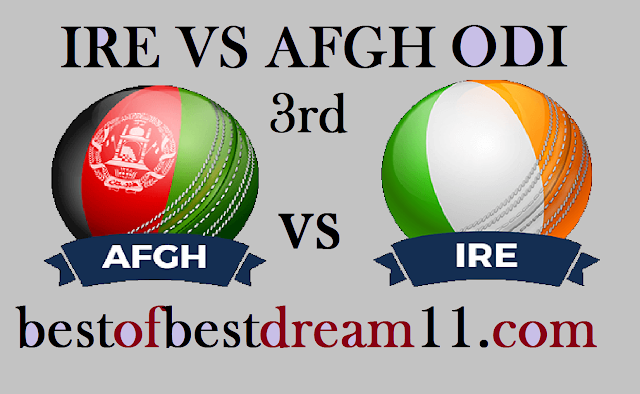 "After losing the first match, the Irish team made a spectacular return and won by 3 wickets in the second match.In such a situation,this match becomes very important for both the teams,the team who wins this match will also win the series. This pitch is very helpful for the bowlers,on this pitch,fast bowlers and spinner can play a good role. For Afgh, Rahmat Shah(29+32) and Asghar Afghan(25+39) have very good batting in both the matches. Gulbadin Naib(64+7) and Hashmatullah Shahidi also gave them good support. in bowling,Rashid Khan(5wicket),Aftab Alam and Mujeeb Ur Rahman have done fantastic bowling. For IRE, Andrew Balbirine(55+60) is in good form and he has done a fantastic performance in both of the matches played so far. Paul Stirling (39) and Simi Singh(36) had batted well in the last match. in bowling, Tim Murtagh is the most successful bowler of the series till now ,he has taken 8 wickets in 2 matches.